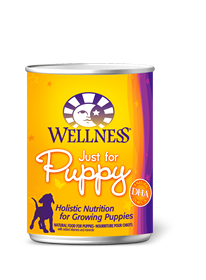 Wellness® Just for Puppy Canned Recipe is nutritionally balanced with fruits, vegetables, vitamins, and minerals to support the development of strong muscles, bones, organs, and teeth. Real-food ingredients include “de-boned” chicken, salmon, barley, flaxseed, carrots, sweet potatoes, apples and pears. Chicken, Chicken Broth, Salmon (A Natural Source of DHA, Docosahexaenoic Acid), Sweet Potatoes, Ground Barley, Carrots, Ground Flaxseed, Carrageenan, Canola Oil, Apples, Pears, Bananas, Guar Gum, Potassium Chloride, Salt, Iron Proteinate, Zinc Proteinate, Choline Chloride, Vitamin E Supplement, Cobalt Proteinate, Copper Proteinate, Manganese Proteinate, Riboflavin Supplement, Sodium Selenite, Thiamine Mononitrate, Vitamin A Supplement, Vitamin B-12 Supplement, Potassium Iodide, Biotin, Vitamin D-3 Supplement. Optimal feeding amounts vary with activity, age, environment and breed. Please use the information below as an initial recommendation only, and adjust as needed. 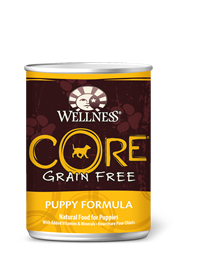 We recommend feeding dry and wet food in combination to increase your puppy’s daily water intake. Feed at room temperature and refrigerate unused portion. Always have fresh, clean water available in small amounts, changing water frequently. Puppy: Feed 198g per day for every 2kg of body weight. For combination feeding, reduce dry by 56g for every 170g of wet food. 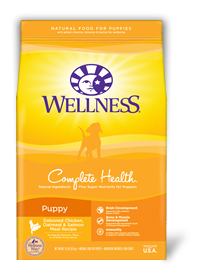 Wellness Just for Puppy Formula Dog Food is formulated to meet the nutritional levels established by the AAFCO Dog Food Nutrient Profiles for growth.